The new super multi-joint manipulator mechanism we introduce in this paper is constructed from a long flexible resinous plate in the center of the manipulator and a pneumatic actuator the same length as the arm arranged antagonistically. The number of power transmission mechanism is fewer than that of joints. Specialized in a winding grip, the mechanism is light and simple. From the effect of this property, the manipulator could be easily extended in the length. The experimental mechanism mode was developed and several experiments were conducted, such as driving on the vertical plane, grasping some objects and moving with flow rate adjustment. As a result, the manipulator could drive on the vertical plane, winds cylinders of 50–200 mm in diameter and controls winding behavior. S. Kikuchi, Y. Yamada, R. Higashi, and T. Morita, “Super Multi-Joint Manipulator by Using Creased Plate and Pneumatic Actuators Arranged Antagonistically,” J. Robot. Mechatron., Vol.27, No.3, pp. 276-285, 2015. N. Giri and I. Walker, “Continuum robots and underactuated grasping,” Proc. ASME Int. Work. Underactuated Grasping, pp. 111-116, 2010. A. Kapadia and I. D. Walker, “Task-space Control of Extensible Continuum Manipulators,” Proc.IEEE/RSJ Int. Conf. on Intelligent Robots and Systems, pp. 1087-1092, 2011. G. S. Chirikjian, “Hyper-redundant manipulator dynamics a continuum approximation,” Advanced Robotics, Vol.9, No.3, pp. 217-243, 1995. W. McMahan, V. Chitrakaran, M. Csencsits, D. Dawson, and I. D. Walker, “Field Trials and testing of the OctArm Continuum Manipulator,” Proc. IEEE Int. Conf. on Robotics and Automation, pp. 2336-2341, 2006. G. Salvietti, H. X. Zhang, J. Gonzalez-Gomez, D. Prattichizzo, and J. W. Zhang, “Task Priority Grasping and Locomotion Control of Modular Robot,” Proc. IEEE Int. Conf. on Robotics and Biomimetics, pp. 1069-1074, 2009. W. McMahan and I. D. Walker, “Octopus-Inspired Grasp-Synergies for Continuum Manipulator,” Proc. IEEE Int. Conf. on Robotics and Biomimetics, pp. 945-950, 2009. M. W. Hannan and I. D. Walker, “Analysis and initial experiments for a novel elephant’s trunk robot,” Proc.2000 IEEE/RSJ Int. Conf. Intelligent Robots and Systems, Vol.1, pp. 330-337, 2000. K. Asano, M. Obama, Y. Arimura, M. Kondo, and Y. Hitomi, “Multijoint Inspection Robot,” Proc. IEEE Trans. on Industrial Electronics, Vol.IE-30, No.3, pp. 9-16, 1990. M. A. Shugen, S. Hirose, and K. Yokoshima, “Moray drive of multi-joint manipulator,” J. of the Robotics Society of Japan, Vol.8, No.1, pp. 237-242, 1995 (in Japanese). M. A. Shugen and S. Hirose, “Dynamic Control Approaches for a Coupled Tendon-Driven Manipulator,” Trans. of the Japan Society of Mechanical Engineers (Part C), Vol.61, No.591, pp. 4359-4364, 1995 (in Japanese). T. Noritsugu, “Pneumatic actuators,” J. of the Robotics Society of Japan, Vol.15, No.3, pp. 355-359, 1997 (in Japanese). K. Kuribayashi and S. Shimizu, “A millimeter-Sized Robot Using SMA and Its Control,” J. of the Robotics and Mechatronics, Vol.7, No.6, pp. 449-457, 1995. E. Yoshida, S. Murata, S. Kokaji, K. Tomita, and H. Kurokawa, “Micro Self-reconfigurable Modular Robot Using Shape Memory Alloy,” J. of the Robotics and Mechatronics, Vol.13, No.2, pp. 212-219, 2001. H. Kimura, M. Kataoka, S. Suzuki, D. Akimoto, and N. Inoue, “A Flexible Robotic Arm with Hydraulic Skeleton,” J. of Advanced Mech. Design, Systems, and Manufact., Vol.7, No.6, pp. 1107-1120, 2012. 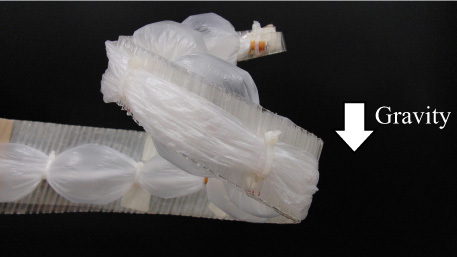 Y. Nishioka, M. Uesu, H. Tsuboi, and S. Kawamura, “Proposal of an Extremely Lightweight Soft Actuator using Plastic Films with a Pleated Structure,” Proc. of the 19th Int. Conf. on Mechatronics and Machine Vision in Practice (M2VIP2012), pp. 491-496, 2012. J. Denavit and R. S. Hartenberg, “A Kinematic Notation for Lower-Pair mechanisms Based on Matrices,” ASME J. of Applied Mechanics, pp. 215-221, 1955. CKD corporation, Technical manual, Speed controller, p. 664.